Helps when removing shirts from the dryer. Hanging them right away helps prevent extra ironing. I put my wet clothes on it to let then dry. works great. Our apartment has limited closet space. This is a great addition. It is used for my husbands shirts to avoid wrinkles and my dresses for the same reason. I would recommend this product. I own an older home that doesn't have alot of closet space and this product is perfect for that extra needed area for hanging your clothes. It's definitely a product I would recommend. I've already purchased two and wouldn't hesitate to buy another, if needed. It's sturdy enough to hold alot of those extras. So helpful not to have to put holes in anything to hang this rack. Its sturdy design will last forever. I am using this product on a door in my laundry room to hang clothes. It is great and easy to put together and use. Love it so much I am using 2. My daughter said she also can use one, perhaps my next order. THIS ITEM WAS ONE OF MY BEST BUYS OF THE YEAR,USE IT WHEN GUEST STAYOVER AND FOR THE FAMILY COAT CLOSET OVERLOAD.CAN TAKE THE HEAVY LOAD AND IT DOESN'T TAKE UP MUCH SPACE WHEN ITS PUT AWAY. IT GAVE ME A LOT MORE SPACE IN THE ROOM I RENT. This product is great, and it's uses are many. It adds extra hanging space in bedroom closets, inside and out. Also, great for guest rooms, bathrooms, and is strong enough to hang winter coats up as you come in from the wet and cold weather. It is a perfect fit over the door. The hangers fit good. I purchased this as a gift for my sister. She had been looking for this specific design. She uses it in her laundry room to hang up clothes as they come out of the dryer. This keeps clothes from wrinkling, and avoids having to fold the clothes then put them on hangers in the bedroom closet. She is absolutely delighted with this product. I currently live with her but am moving to my own apartment soon. I am going to get one for myself. It saves times, keeps clothes neat, and avoids having to have the two step process of folding and then hanging up again. I highly recommend this product. No More Clothes on the Floor! You no longer have to make holes on the wall! This clothes hanger is perfect! I love this rod. It is sturdy and very functional. I have had this over the door rod for nearly a year. I use it in my laundry room for clothes coming out of the dryer so I don't have to iron. I also use it occasionally to hang damp clothes to finish drying. It holds a lot of clothes. I've been know to have a week's worth of outfits for work along with several sweatpants. The newly ironed clothes stay ironed, rather than laying them on bed prior to putting them away. When company comes I like to give them a place to hang their clothes. This is better than anything else I have found. I use it for extras, myself, when they are gone. I have used this product for many years; but am now moving from a large home to an apartment with hardly any closet space. I am buying many more to help me add some more clothes storage. I screwed it straight to the wall of my laundry room. It was exactly what I was wanting. I'm so glad I found it. 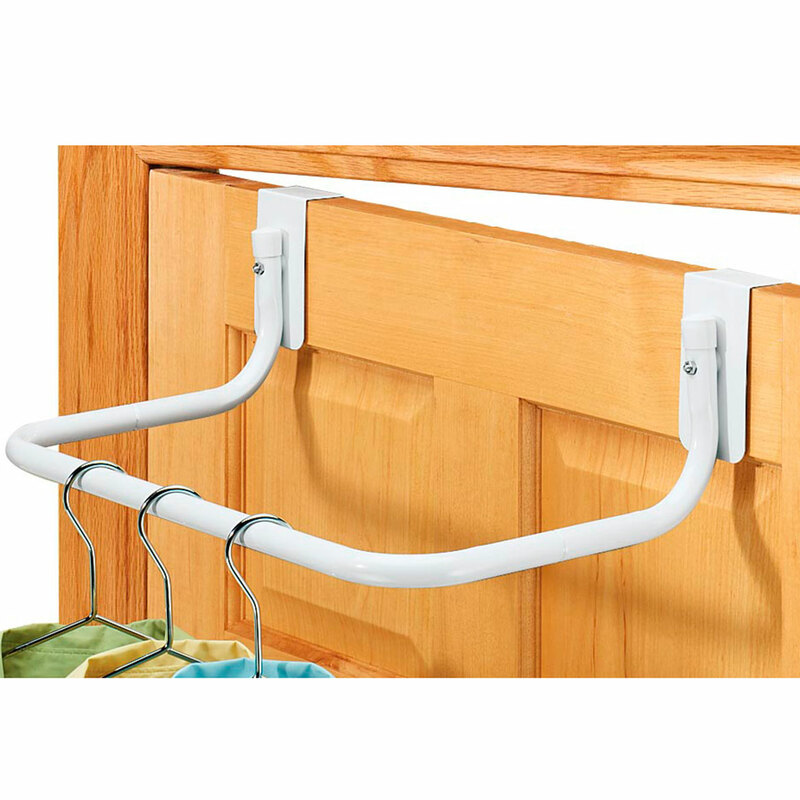 you don't have to keep running to the closet for hangers, you can have them in the laundry room for easy access. My good friend ordered several of these. I was so impressed on the space that was saved,I couldn't get home fast enough to order me some!!! I need some extra space for my overflow of clothes. I have a utility room that I have used for lots of various storages. I put on my utility room door and I was able to hang around 30-32 short sleeves shirts on this rack; it held them quite nicely; and you do not see the shirts on the otherside of the door. It was a great space saving for me for a great buy! I use the closet rod in the laundry closet and on my bedroom closet to hang clothing that I reach for the most. I am always surprised and thrilled by how much the rods hold. I am able to see what's available quickly and easily and grab what I need without fuss. I have yet to find anything wrong with them. hang clothes while wet to dry; hang towel after bathing. The closet rod adds great additional hanging for out of the closet space. I use it most in my laundry room to hang clothing to dry or waiting to be ironed. It is very durable and hold lots of clothing at once. I wouldn't worry about weight hanging on it. I really feel it was a smart purchase. I needed this! Just what i was looking for, so convenient. Needed a place to hang clothes convenient to the dryer. This is perfect. I just received my order today! I bought two of these and am now going to order two more! I hang a lot of things up to dry, to this is a godsend! This was fairly easy to put together for a 63 year old woman! I can still close the utility room door and the bedroom door I hung these on! No issues at all! I'm thinking about buying a 2nd. one! I use this product to hang the jackets I wear to work every day. It makes getting dressed in the morning much more convenient and fast. It also provides more space for clothes on the other bars. I was impressed that I could actually close the door due to the slim design over the door's edge. I'm thinking about buying another. hangers for our small house. Thanks Miles for these great hang rods! I will probably order a few more! I like how sturdy it is and how much you can hang on it. The hanging bar sticks out enough to accommodate a hanger instead of making you have to hang things on top of each other. Lots of extra space for clothes in a small space. Over the Door Clothes Rod Great! I use it on my bedroom door & it works perfectly. I may buy another one for the guest room. It was so easy to put together & took very little time. MY CLOSET HAS THE ATTIC DOOR IN IT SO A TRADITIONAL ROD IS NOT POSSIBLE. I WASN'T ABLE TO HANG ANY CLOTHES IN THERE, JUST USED IT FOR STORAGE. THEN I SAW THIS ROD ON THE WEBSITE & BOUGHT IT. IT WORKS GREAT, I COULDN'T BE HAPPIER. FINALLY NO MORE WRINKLED CLOTHES FROM THE DRAWER. I PUT IT ON THE INSIDE OF MY CLOSET DOOR & HANG ALL MY CLOTHES ON IT. IT'S THE BEST PRODUCT. Until you get this product home, you don't realize what a help it can be! Great design, too. Thanks! It was a product that I needed when I do the laundry. GREAT IN THE LAUNDRY ROOM TO HOLD CLOTHES FROM THE DRYER, STURDY. USEFULL IN BEDROOM CLOSET AS WELL FOR EXTRA SPACE. I gave this as a housewarming gift to my daughter who lives in an older home with miniscule closets. With this bar, she doesn't have to clear out space in the guest room closet but just pops this over the closet door for me to hang my things. Plus there is so much room on the bar, it gives my clothes room to lose the wrinkles from packing. PERFECT FOR HANGING EXTRA CLOTHES OUT OF SIGHT! THANKS WALTER DRAKE! In the bathroom, it is perfect. Purchased 2 of them. Good item. Wife uses it in her sewing room for hanging the ironing on. I bought this rack for my laundry room, it is the perfect size. Super easy to install and makes doing laundry that much easier by providing the needed space to hang up clothes right out of the dryer, preventing unnecessary ironing. Love it, highly recommend it. very handy for drying clothes, but in the way when not in use. It holds many items but in a manner that makes them easy to go through and hang. Helps solve the 'I never have enough closet space!' Problem. Easy to assemble.. Good quality, kinda light but durable.. Highly recommend for extra space.. Many uses like for hanging wet clothes, towels and so much more..
i have owned one of these for many years now. i find them to be the most valuable help in my closet. i have small closets and never enough room for my clothes, but this gadget expands my hanging space! i just ordered two more. they are very sturdy and hide on the inside of the closet door very well. I use this over my bedroom door to hang my work clothes on .I am ordering another one to use in my laundry room . It comes in very handy for me . I use it to hang the clothes on I'm going to wear when I'm getting ready to go out somewhere. I think it is just handy to have . I really like this rack. There was is plenty of room to hang many items, and they can be hung a distance apart as they cool from the dryer. Also, it sits high enough on the door that I don't hit my head on it, and I'm tall! Can hold a lot, makes it easy to hang laundry as you take it out of the dryer and hang. We love it! Thought it might not hold a lot of weight, but seems to hold it's own. Durable and design is far enough from the door for full size hangers. For the price, well worth it. I have had one of these hanging on my closet door for a long time and it's just so handy to hang newly washed items to keep them from wrinkling. I have a many-pocket jewelry holder on it and it is so easy to see just what's in each pocket. It is perfect for an overloaded closet. I love this holder! Ideal for a closet that has to many items. Help to keep frequent items that are often used. Sturdy and well built, should last a long time. extra hanging clothes when ironing. also for company clothes when closet full. This is my second over the door closet rod and it is very handy. Over the door to give us more hanging space. Great item for the money. My only complaint is that I can't close the closet door when using the closet rod. This worked fine for me but wish it had different colors. Well made, but white is not right for my wooden doors. Before assembly, I used brown spray paint on the visible bracket portion, then assembled. While the brackets accommodate thick doors, they are 1/2" too thick, which causes them to "rock" and therefore not clear the sliver of space between the door and jamb. They need to provide dense foam pads inside the bracket to take up the slack and protect the door (as oversize causes it to wiggle and sit crookedly, which can ding the door. Once again being resourceful, I used cut down wooden paint stirrers to take up slack and stabilize, and a small piece of foam shelf helmet liner to protect the door. great product, easy to install and move wherever you want, hold a lot of clothes, makes ironing so much easier, very sturdy, only drawback is you can't close the door when using, but when ironing there's no need to. I am very satisfied with the strength of this rod because I use it to dry clothes. I currently only have a washer, so I hang clothes on hangers and use this over the door rod to allow the clothes to dry. The over the door rod improved the look of our bedroom with added space. It don't look cluttered any more. We made a very good choice shopping at Walter Drake. Expecting guests over the holiday, because my closets are full to capacity, I needed a convenient place with easy access to hand my guests outer-wear. I found this item easy to assemble and hang. Worked perfectly. I like this closet rod. I use it when I have blouses to iron or when I want to air dry some of my tops. It's easy to assemble and I put it in my closet when I'm not using it. It's handy to have around. Would be great,mine was missing the end caps and hex screws. Huge ,sturdy but mine was missing hardware.Ill have to get screws. I got this because I needed a quick easy place to hang my clothes while I'm getting dressed. They work ok. A bit flimsy. Don't hold much. But, I still am glad to have it. Very useful item. Handy when ironing or for extra hanging of laundry or coats. I bought this because my closet isn't big enough. However, the brackets that hang on the door are buckling under about 18-20 pairs of pants. Is the weight shown on the picture (4 shirts) close to its capacity!? This rod droops down and does not hang as shown in the ad. The joints don't connect tightly and they come apart. This product is absolutely useless. I threw it away. Use over closet door but do not hang heavy garments or items such as coats, jeans, etc. 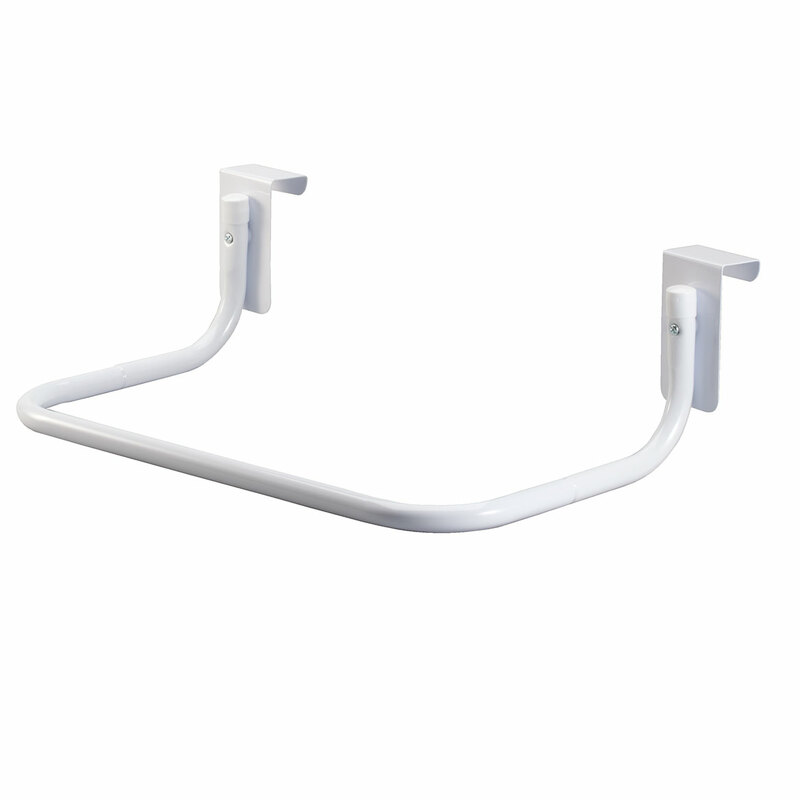 Light weight, thin wall tubular parts bend. Poor quality, metal to weak to hold coats or many items also will not allow most doors to close. Doesn't fit a single door in my house! The only interior door in my house that this fits on is a bi-fold and the door won't open with it hanging on there. Just a bit too narrow to go over the doors that measure 1-1/2" without scratching paint or marring finish. It does fit on a cubicle wall, however, so son may take it to work to hang up his winter coat, etc. Would have been perfect for what I needed; but unfortunately the hook was not wide enough to fit over my closet door. I chose this for my bathroom because I do not have enough racks there. Need to create more closet space. This looks like it will help with that. My last one was used so much it bent. For drying rod in laundry room and separating exercise clothes from regular laundry. I hang a lot of my laundry up to dry and I don't have enough space to hangs. Hopefully these will solve that problem. I've been looking for a rack to serve as a dual towel rack similar to what I purchased years ago. Seemed to be just what I am looking for. Prefer the rod to hooks as it provides more space. need something like this near the dryer, but out of the way of everything else. If this fits on the door it will work. I needed extra places to hang laundry. Small utility room and this will give me a place to hang items as I take them out of the dryer. Perfect for storing extra closet items. This should come in handy for I drip dry a lot of clothing. Closet full and need more hanging space. I've always wanted one, thank very much. better that a hook, you see things better. It looks sturdy and I like the in-line design rather than the one with the holes that juts out. It doesn't have the best leverage. It looks like it will be strong. Bought one many years ago, it is still in good condition , Looks brand new. Wanted another to use when I am ironing. To help me when I am doing wash and after drying the clothes so I may hang without wrinkles. BEST ANSWER: Thank you for your question. Minimal assembly is required. We hope this information will be of help to you.